Back to the 'regular' 12 pages with this issue of Hyakunin Issho - the previous couple were only 8 pages, but at that rate, we'd never get in all the stories I want to include! It's been a somewhat crowded summer here this year - both daughters came over to Japan for visits, and just as they were leaving, a special 'printmaking guest' came and worked here through most of August. You can read about him in this issue, where you will also find more in the Halifax to Hamura adventure, and another Collector Profile. There is no Studio Diary this time, as I really didn't have much chance this summer for construction down in the new workroom, but Sadako's Corner is here to round off a full issue. I hope you will find something of interest inside! The woodblock publisher that I was visiting in Mejiro was known as the Adachi Institute of Woodblock Printmaking. I had seen some of their prints back in Vancouver; some years before this Adachi had donated sets of prints to various universities and libraries around the world, and I had avidly studied the set in the Asian Studies library at the university near us. I had also seen a magazine story about the company, which showed photographs of their second floor workshops, a large room where three or four printers sat in a row at their benches and a smaller room with three carvers working on blocks. In addition to this, I had read about the Adachi workshops in one of James Michener's many books on Japanese prints. Our visit that morning was only a couple of hours - not very long to spend at a 'fount'! Mr. Adachi was kind enough to spend time with me and to listen to my plans for making prints by carving and printing by myself. I no longer remember much of the conversation - at that time my Japanese was extremely rudimentary, and I really didn't understand most of what I heard - but I do remember that I was allowed a quick peek upstairs. The two rooms matched pretty much what I had seen in the magazine photographs. As we stood in the doorway looking in, the workmen completely ignored us; I can imagine what I must have been feeling - let me stay here for a while! Let me sit and watch, try and talk with them, take notes on what I was seeing ... But of course none of that was possible; these people were busy making prints. This was not a school, it was a workshop, and I would have to be content with just this short glimpse. Before leaving, we bought a few of their prints - if I wasn't going to be able to take back much knowledge of the printmaking process, at least I could take back 'samples' of the end result of that process! And then, just at the end of the visit, when we were in the entranceway putting our shoes on, Adachi-san reached up to a high shelf on which blank blocks were stacked up airing out before use, pulled one off the stack, and presented it to me. And that visit was pretty much the end of our three-month adventure in Japan. A few days later, after a round of souvenir shopping, we flew back over the Pacific and returned to our tiny basement room. I was of course quite 'fired up' and eager to work on some more prints. First though, there was a small problem that had to be solved - how to make a living? Having just finished up that quite major programming job for the music company I naturally had a go at looking for more work in that line. But this was still early days in the desktop computer revolution (this was early 1982), and not many business people were willing to listen to proposals from 'solo' systems designers like myself - in their minds, computers were giant machines run by men in white coats. Not surprisingly, I found it a very 'hard sell' to convince somebody that I could do something productive for their business. The days went by, and my savings dropped lower and lower. 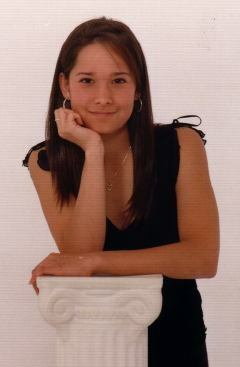 Once upon a time (it seems such a long time ago now!) I used to have a 'normal' job where I went to the office each day. Part of the work involved meeting people - suppliers or customers - so it was of course necessary to keep an appointment schedule. I guess in a typical week there might have been two or three such appointments, so the schedule was just casually noted on a calendar on my desk. What an 'amateur' I was! I learned that this month when I was chatting with Mr. Takeshi Udagawa, one of my collectors, and had a chance to look over his shoulder and see his appointment book. The page I saw was a 'month-at-a-glance', and speaking with no exaggeration, I can report that there was absolutely no white space left on the sheet; it seemed that not a minute was left unaccounted for. It might be that many of you who read this will just shrug - your own daybook perhaps looks just the same as his - but to me it was quite a shock to see this. What kind of job would keep somebody hopping around so much all the time? Well it turns out that the 'job' is responsible for only around half of the entries in the daybook; Mr. Udagawa is an employee of the Tokyo Metropolitan Government working on projects involving publicity and promotion for the Port of Tokyo. I can see how that would involve a lot of meetings and events, and of course plenty of overtime, but surely not 16 hours a day? Any detectable theme there? I think I can see something ... the word 'traditional' comes to mind immediately. But traditional in a sense quite different from what one sees in my work; I merely copy old prints - I live in the past, as it were. But to Udagawa-san and the other people in the groups he is part of, incorporating traditions into contemporary life seems to be the point. Living in one of the most modern vibrant cities in the world, they work to maintain a continuity with those parts of the culture that are worth preserving. As I talked with him during our meeting, something else became gradually apparent: in most of the activities in which he is involved, he is not 'just another' member - in most cases he is up in the front seat, actively directing group activities. I guess Udagawa-san long ago gave up on the idea of trying to describe all his 'hats' on his business card, but if I were trying to design one for him, I think the job description would be best wrapped up in a single word - facilitator. The word 'facilitate' has a number of nuances, including assist, expedite or even empower, and I think these all describe this man's function during those long days. In comparison I feel quite selfish, shut up in my own room all day working on my own projects, but I think that society needs both types. It needs single-minded people who focus on the one thing and commit their energy to it, but it also needs those people who gather up the threads and pull them all together into the larger 'fabric'. He and I have each chosen work that suits our personalities; I know I'm happy in my work, and seeing the light in Udagawa-san's eyes as he showed us one of the traditionally dyed fabric pieces that he helped prepare for official port visitors from overseas (see photo), I know that he's found his calling too! During this meeting with him I came to understand better just why he supports my work - but for the life of me I couldn't see how he ever has the time to even open the print package each month. No problem, he said ... just a little bit less sleep on the day that a print arrives! A couple of pages back, in the 'Halifax to Hamura' story, I used the phrase the 'fount' of all traditional printmaking knowledge ... the Holy Grail ... Japanese readers of this newsletter perhaps wondered just why I used such a seemingly exaggerated expression, after all here in Japan knowledge of woodblock printmaking methods is easily come by; every library has books on the subject, and it would be a rare community which didn't have a least a few hobbyist printmakers from whom one could learn things. But of course, overseas the picture is very different. Although a number of books on the subject have been published in English over the years, getting actual contact with woodblock printmakers is pretty much impossible. Now woodblock printmaking isn't actually a very 'high-tech' process, and to make rudimentary prints is quite simple, but to move above that level and produce fine work is a different story. The simple materials and techniques can actually be used in extremely subtle and sophisticated ways, and it becomes quite impossible for someone working alone to duplicate what has been learned during the 300+ years of technical evolution of the craft. 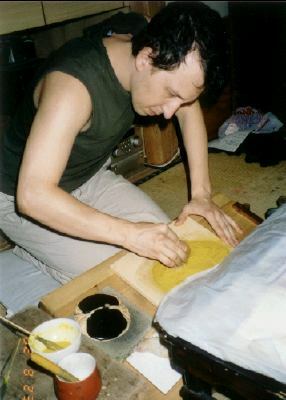 So for someone in the position that I was in those days - living in Canada and endlessly struggling with such things as how damp the paper should be, how the pigments were mixed, how to hold and use the baren ... there was no exaggeration at all in referring to Adachi's workshop in Japan as a kind of holy grail. More than twenty years have passed since the visit described in that story ... and now it is I who is here in Japan, spending his days sitting in a workshop surrounded by a jumble of carved blocks, stacks of washi, shelves of pigments and supplies, and drawers of woodblock prints. And although I sometimes find this a bit difficult to believe, my own workshop has become a similar 'Holy Grail' in the eyes of some. I should hasten to interject that in no way am I trying to equate my own workshop with that of a place like Adachi, with its long history and vast reservoir of accumulated knowledge. But everything is relative, and to the twenty-years ago David - or to people like him - a visit to this room would indeed be a visit to the 'fount'. Over the years, I have had many requests from people who wish to learn printmaking with me. In general, I am polite but not so enthusiastic in my response to them. I used to be very open to such requests, but learned that most of the time spent with such visitors was actually wasted, because they never continued with their printmaking - making a woodblock print (at least of the traditional type in which I specialize) is an extremely slow-moving, time consuming, and repetitive task, and requires a certain combination of personality traits: patience, stubbornness, the ability to postpone 'gratification' through endless tribulations, and perhaps most of all, a willingness to cut your losses and start all over again when necessary. In the old days, when young men were starting their working life, they were simply told what profession to take up, and 'personality' didn't enter into the equation, but in our own age, we each choose our vocation voluntarily, and this particular 'combination' seems to be not so frequently found. But this year, for the first time, I had a different experience. A young man from the Ukraine contacted me last summer to ask about the possibility of visiting here. 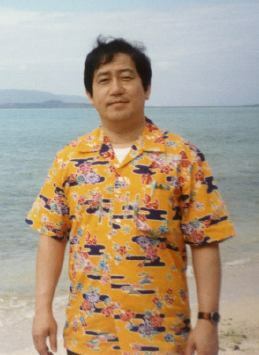 He was at that time in Japan for a short stay so I agreed to an afternoon visit. He was personable, seemed quite interested, and asked good questions; nothing was then promised between us, but he obviously understood my reticence to spend time with would-be printmakers, because during the winter I received a package from him containing two very intriguing woodblock prints that he had made. That was all the confirmation that I needed - he was a doer, and not just a talker - so when he asked this spring if he would be able to come and work here for some weeks during the summer, I assented immediately. Slav (his full name is Vyasheslav Varlakov), spent most of August here; we set up an area for him to work down in the first basement, and he spent long hours nearly every day hunched over the carving bench that he had brought with him folded inside his suitcase (he took it apart and turned it into a printing bench later). Slav is a professional engraver, working mostly on metal, jewellery, etc., and so is very familiar with the pace of this kind of work. But although he already has a satisfying profession, he is still fascinated by this kind of printmaking, and wants to explore it as thoroughly as he can. He is not my apprentice, and I am not his teacher - he is completely self-motivated, just as I have been during the years of my own progress 'up the ladder'. The main benefit for him being here this summer was simply to rub shoulders with me, to feel the rhythms of the work, to feel the moisture in the paper, to bring his own methods a bit closer to traditional ones ... just the kind of things I myself wanted to see so desperately all those years ago. How many more will follow him ... ? I chanced upon David's website about a year and a half ago while doing research on woodblock printing. 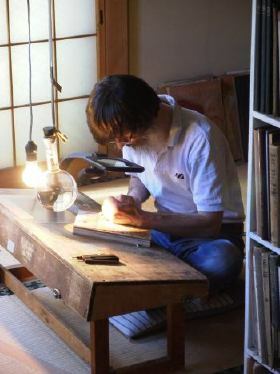 Besides being impressed by the wealth and quality of the information the site offered, I was also intrigued by the person who put all this information together so well and whose stories and essays I found as interesting as his discussions of woodblock techniques and materials. After following the website for about a month I decided to send David an email asking if I could drop by his workshop during my planned visit to Japan the following summer. David's response was a very polite 'no', due to time constraints connected with preparations for his upcoming show in Osaka. Nevertheless, he added that if I so wished, I could stop by his booth at the show. This I did, bringing with me the results of my first attempts at woodblock carving. Despite the sorry quality of what I had to show, David was gracious enough to show interest in my blocks and at the end of our conversation invited me to his workshop in Ome. I went there several times. During these visits I observed David at work, asked questions about the craft and culture of Japanese printmaking, and looked through David's collection of books and prints. By the end of my stay in Japan I felt that David had become a friend and when several months later I began thinking about returning to Japan to learn more, I felt very comfortable asking David if I could set up my carving bench in a corner of his workshop. In contrast to last year's visits with David, when I learned about Japanese printmaking only though looking and listening, this year I learned by actually doing, that is by carving and printing a block. I brought with me my tools, carving bench, and a block prepared with a design which I had begun back at home in New York. As I worked on it, David offered me guidance and advice by pointing out mistakes, showing ways of handling tools and materials and suggesting helpful techniques and workarounds. He also shared with me his insights into the nature and culture of the craft, enriched by his understanding and long experience of living in Japan. These were of great interest to me, as I was struggling to grasp the many fascinating - and sometimes difficult for a westerner to understand - aspects of Japanese culture. 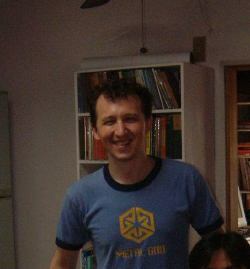 At the same time, I found it very beneficial that my learning and friendship with David was unencumbered by the master-disciple relationship traditional in Japanese workshops, which, to be sure, has its venerable ways and wisdom, but which requires slow development and a long period of apprenticeship. This would hardly have worked in my situation, when I had to absorb as much as possible in a short time. Learning from David was an invaluable experience and I am deeply grateful to him for the hospitality and generous willingness to share his time and knowledge. It will be a surprise for David to read this, but I felt that he looked nicer every time he used this word; somehow more graceful. In the early days that I knew him he was still living with his two daughters and taking care of them. Although I had no idea what kind of meal he - a Canadian guy - would prepare for the evening meal it was obvious that he wouldn't cook a dinaa. While we were chatting on the phone I sometimes heard him use the expression "After dinner ..." or something like this. On my side I was having supper, and over there he was having dinaa! It was so nice to imagine him having that kind of meal. After a few years his two daughters moved to their mother's place in Canada and the two of us were able to have dinner together more frequently. I discovered something very interesting; even though we might be having a casual supper at a local family restaurant I was able to enjoy a rich and luxurious feeling once we used the word 'dinner'! Why does this happen? So I started to refer to the evening meals I myself prepared as 'dinner'. I felt somewhat embarrassed to do so at first, but it worked very well! Even if the meal was plain, I neatly placed the food on the plates and said "Let's have dinner." As we sat face to face and picked up our utensils to eat, my feelings of appreciation for the meal were intensified. Words are such strange creatures! This year Himi was able to stay for a few weeks, as she had taken extra time away from her job in Vancouver. Her visit was quite a 'time slip' for me, as we spent a lot of time doing something we used to do years ago: playing difficult computer games together using our combined skills to get through the challenges. She also talked about her plans for the coming year, and these include taking courses in training to be an 'esthetician'. She is quite interested in this, and I think it suits her congenial nature well; she enjoys meeting many people, and could never work in 'solitary' like I mostly do! The time with younger daughter Fumi didn't go quite like I had expected - shortly after she arrived, she and a local friend signed up for jobs at a nearby theme park, and most days she worked a 12-hour shift over there. I saw her only for a few minutes in the morning and late evening. On her days off she frequently went out with friends, and I really had to face up to the fact that this daughter too, has now grown to the stage where only a very small fraction of her time is going to be spent doing things with her father. The girls are now 19 and 17 years old. One is kind of settling down a bit, and one is just starting to unfold her wings; it's all very interesting to watch. I think they are both good people, and have the necessary self-confidence to create a happy and productive life. Next summer? Who knows ... that's an eternity away!